James Greenwood : Surfriding in Hawaii and Tahiti, 1863. H.S. Melville : Hawaii and Rev. Ellis : Tahiti. Greenwood's book is an eclectic combination of diverse reports from numerous countries based on extensive quotations from various commentators. The surf riding content appears in Chapter IV, "Savage Pastime", recording various recreational activities ranging from New Zealand, across the Pacific, to North America. The text quotes from Rev. William Ellis' account from "the harbour of Fare in Huahine," circa 1820. "Woodcut and design by Harden S. Melville. Melville served as a draughtsman on several expeditions by the English navy in the western Pacific between 1841 and 1845, and produced a signficant amount of work before returning to London by 1847. It is unknown if Melville visited Hawai'i, but there is a possibility that he crossed the Pacific on his return to England. The illustration bears a remarkable similarity to Surf swimming at Hawaii, Sandwich Islands, printed in Leslie's Illustrated Weely in 1866, see Notes, below. Faahee, or surf-swimming, is another favourite pastime with these people. According to Ellis, "individuals of all ranks and ages and both sexes follow this sport with great avidity. They usually selected the openings in the reefs or entrances of some of the bays, where the long heavy billows rolled in unbroken majesty upon the reef or the shore. distance, sometimes nearly a mile- watched the swell of the wave, and when it reached them, resting their bosoms on the short, flat-pointed board, they mounted on its summit, and amid the foam and spray rode on the crest of the wave to the shore; sometimes they halted among the coral rocks, over which the waves broke in splendid confusion. When they approached the shore, they slid off the board, which they grasped with the hand, and either fell behind the wave or plunged towards the deep and allowed it to pass over their heads. Sometimes they were thrown with violence upon the beach, or among the rocks on the edges of the reef. So much at home, however, do they feel in the water, that it is seldom any accident occurs.
" I have often seen along the border of the reef forming the boundary line to the harbour of Fare in Huahine, from fifty to a hundred persons of all ages, sporting like so many porpoises in the surf that has been rolling with foam and violence towards the land; sometimes mounted on the top of the wave, and almost enveloped in spray, at other times plunging beneath the mass of water that has swept like mountains over them, cheering and animating each other; and by the noise and shouting they made rendering the roar of the sea and the dashing of the surf comparatively imperceptible." First published as Curiosities of Savage Life by S.O. Beeton, London in 1863. In 1864, Beeton's issued a "Second series," that is a second voume, titled Savage Habits and Customs. The two series were jionty published in a third edition, in two volumes, in 1865. Another edition was published by John Camden Hotten in 1869. 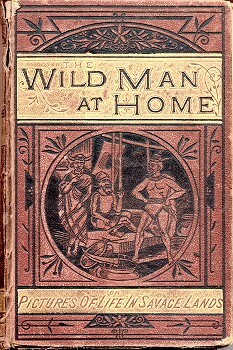 It was subsequently published as The Wild Man at Home: or, Pictures of Life in Savage Lands. Ward, Lock, and Co., London, circa 1885. 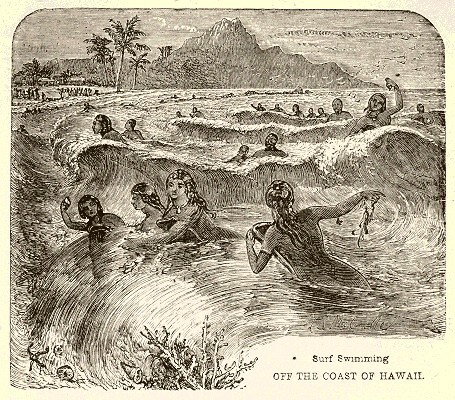 The illustration bears a remarkable similarity to the unaccredited image Surf swimming at Hawaii, Sandwich Islands, printed in Leslie's Illustrated Weely, New York, 7 April 1866, page 37. Greenwood was a British social explorer, journalist and writer. Although primarily a journalist, novelist, miscellaneous writer, and author of juvenile fiction, Greenwood authored several works on savages. 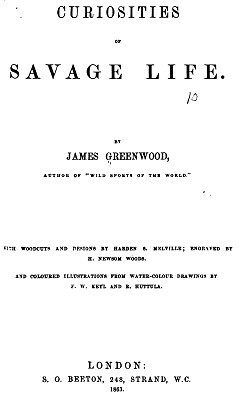 It is unlikely that Greenwood travelled to the South Seas, either to Tahiti or Hawaii, in the 1800s. A son of the London engraver, lithographer and watercolour painter Henry Melville (1826-41), Harden quickly established a reputation as an artist and between 1837 and 1841 had had three paintings hung in the Royal Academy’s summer shows. In 1841 he accepted the position of draughtsman on board HMS Fly, a decision he later recalled as inspired by reading Captain Cook’s Voyages as a boy, to conducted the first official hydrographic survey of the north-east coast of Australia. A considerable body of his Australian and Pacific work is known. Bush Scene, Swan River, W.A. is in the National Library. Following his return to London in 1847, Melville continued his career as an illustrator and painter. A collection of twenty-five tinted lithographs (hand-coloured in the expensive edition), each with a leaf of descriptive notes, titled Sketches in Australia and the Adjacent Islands (London) was published in 1849. Included are views of Port Essington (Northern Territory), the Queensland and New South Wales coasts, Port Phillip, Van Diemen’s Land, the Swan River (WA), New Guinea, Timor, Java and other places visited. wood’s Curiosities of Savage Life (London, 1863), Harden supplied five illustrations of Australian Aborigines and their weapons. The autobiographical The Adventures of a Griffin on a Voyage of Discovery (London 1867) contains a frontispiece and twenty-nine other illustrations drawn on the wood by Melville from his original voyage sketches, then cut by H.N. Woods. 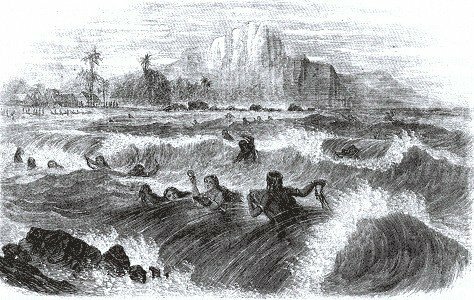 Leslie's Illustrated Weely (1866): Surf swimming at Hawaii, Sandwich Islands. As stated in the introduction, Melville's illustration bears a remarkable similarity to Surf swimming at Hawaii, Sandwich Islands, printed in Leslie's Illustrated Weely in 1866. New York, 7 April 1866, page 37. The entry for Leslie's Weekly in 200 Years Surf Lit (2004) page 22, notes the surfing text is from Rev. Ellis, but does not indicate if this is the report from Tahiti (c1820), or the one from Hawai'i (1823). If Tahiti, it raises the possibility that the Leslie's staff "lifted" the whole piece from Greenwood. Melville was a successful artist and is known to have, at least, traveled to the west Pacific in the 1840s. The significant differences are in the coral and sea-life in the bottom right corner and the mountain profile in the background. In the 1866 illustration, the bottom right corner has some large rocks and the mountain formation is, perhaps, less Polynesian. Furthermore, on close inspection it is difficult to confirm that any of the participants is demonstrably wave riding, although it must be said that it is poorly represented in most of the early illustrations. In both illustrations, the swimmers, some with small boards, appear to be harvesting shellfish and seaweed. First publishes as Curiosities of Savage Life by S.O. Beeton, London in 1863. Warwick House, Dorset Buildings, Salsbury Square, E.C. 1885. Evening Bulletin, Honolulu, July 17, 1908, page 7.
and women (in impossible attitudes) who, standing on the tiniest of boards, stood poised upon the crest of monster rollers. accomplished the art of standing on the waves." Geoff Cater (2007) : James Greenwood : Surf Riding in Hawaii and Tahiti, 1863. The Adventures of a Griffin on a Voyage of Discovery. and apparently entertained little fear of them.